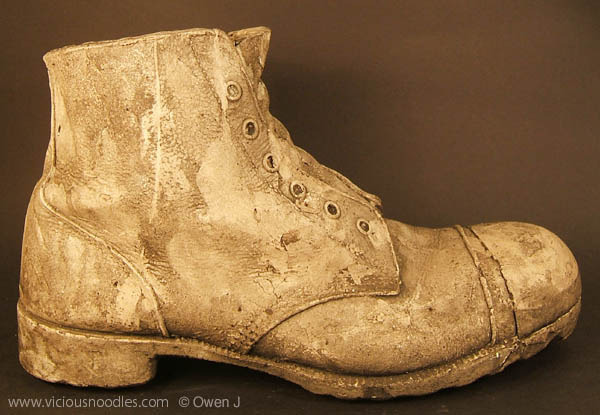 The boot in this picture is cast from a genuine size 11 miner's boot (right foot), made by my partner, Owen, from waterproof plaster polymer. The miner in question was my Taid (pronounced ‘Tide’) which is Welsh for ‘Grandfather’. His name was Thomas Glyn Jones and he was born in 1909. At the age of 14 he went to work at Point of Ayr Colliery in North Wales. He worked there for fifty years until his retirement in 1973. Taid’s original boot has now been used to create this garden planter. My Taid was passionate about gardening. When he’d finally done his time mining coal underneath the earth (well technically he was under the sea as Point of Ayr was beneath the Dee Estuary; the coal field extended northward out under the Irish Sea) he spent his later years planting stuff in the earth: tomatoes, cucumbers, peppers, vegetables and flowers, you name it. I wonder what he would have made of this. He probably would have laughed and said something in Welsh ridiculing the idea of having an old, workman’s boot as a garden decoration.